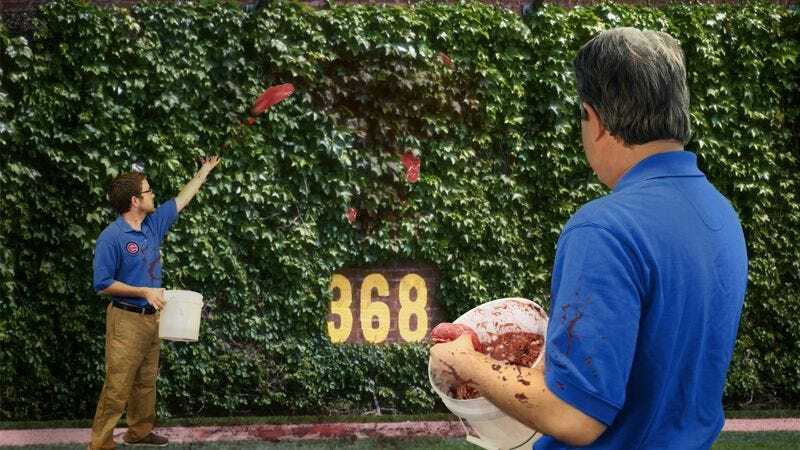 CHICAGO—Standing several feet back as they tossed a ground-up, blood-soaked mixture of beef and pig meat toward the outfield walls, members of the Wrigley Field grounds crew reportedly spent Tuesday afternoon feeding buckets of raw meat to the ballpark’s hungry ivy. “In order to keep the ivy healthy and lush, we have to make sure to maintain its diet of at least 600 pounds of meat per day,” Cubs head groundskeeper Roger Baird told reporters, raising his voice so he could be heard over the guttural gnashing and slurping sounds of the ivy as it feasted on its food. “We have consistent feeding times every day at 9 a.m., noon, 3 p.m., 6 p.m., and 9 p.m. If we miss any feedings, the ivy gets pretty upset and starts making loud groaning noises, so we’re very diligent about the schedule. And we always have to remind fans to never feed the ivy, both because of its diet and for safety reasons.” At press time, in anticipation of the Cubs game later in the day, workers were cleaning up the bone shards and chunks of cartilage that the ivy had spit back out all over the outfield.